Base of Operations: New York City, NY, U.S.A.
Powers/Abilities: Sun Girl was a top acrobat and skilled in both judo and jiu jitsu. She employed a "sunbeam ray" gun, which could produce a bright blast of light. She also appeared to have some level of superhuman speed. Her "emergency pouch" carried useful items such as a lariat and a "portable electric tracer" which could track radio signals. History: (Sun Girl #1-3, ga) Sun Girl was a highly respected heroine who fought crime after the end of the Second World War. (Captain America Comics #69, ga) She briefly worked with Captain America after his second partner, Golden Girl retired. (Human Torch Comics #32-35, ga) She partnered the Human Torch while Toro was away, nursing his sick mother. (Marvel Mystery Comics #88-89, ga) Sun Girl teamed up with Golden Girl and Namora. Comments: Never named in the original comics, Sun Girl's identity was finally given when she reappeared in "Saga of the Human Torch" #3 and 4. There she was identified as Mary Mitchell, personal secretary of Jim Hammond. 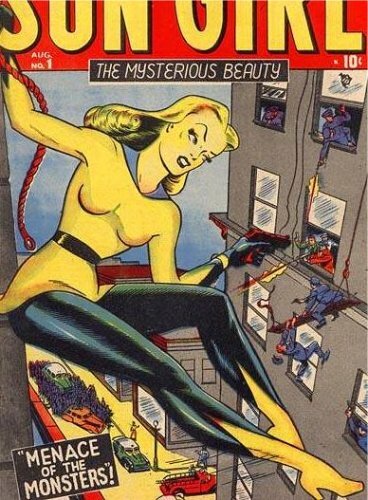 Her Golden Age adventures were downplayed, apparently retconned out of existence for the most part. It was stated that Mary had fallen in love with the hero, and when Toro temporarily retired, she had adopted the Sun Girl identity to get closer to him. Upon Toro's return, she seemingly retired from action. Assuming that she still worked with Captain America for a time, then another bit of retcon means it was actually the Patriot in that role, taking the place of the missing original. Sun Girl turned up again in Marvel Adventures Super Heroes #21, a story set in the alternative countinuity of Earth-200151 (regular Marvel is Earth-616, for those who didn't know), where she informed the Avengers of a dilemma facing fellow retired Golden Age character lines Gary Gaunt.